Finding the perfect bedding for your home can be a challenge. You want it to be a great price but also gorgeous in your home. BeddingStyle.com lets you get a great night’s sleep and decorate your home with gorgeous, luxury and top designer bedding brands. They are your online bed and bath store with a great collection of bed sets and bath products at prices you’re sure to love! At BeddingStyle.com you will find top designer brands like Nautica, Tommy Bahama, Vera Wang, Tommy Hilfiger, Laura Ashley, and more. You will find unique prints and patterns that incorporate a lot of color. They also carry a variety of shower curtains, beach and bath towels, window treatments and other bath accessories. BeddingStyle is truly your one stop shop when it comes to all your needs for bed and bath. Be sure to check out their gorgeous giftware collection which includes designer candle sets, fleece blankets, robes, and fragrance diffusers. BeddingStyle has been online since 2004 with over 150,000 customers! They know what their customers are searching for at the right prices! Shopping online is such a time saver. I no longer have to make it an all-day affair to go shopping for my home decor. I am happy knowing I will receive only first-rate products from BeddingStyle. Looking to make your bedroom feel more modern and refine? If so, the Vera Wang Nordic Leaves Duvet Cover is absolutely perfect. I love the delicate pattern and subtle hue. The 200 thread count cotton sateen sheeting will provide you with the ultimate in comfort. Vera Wang is well-known for her attention to detail that definitely shows in this gorgeous duvet cover. 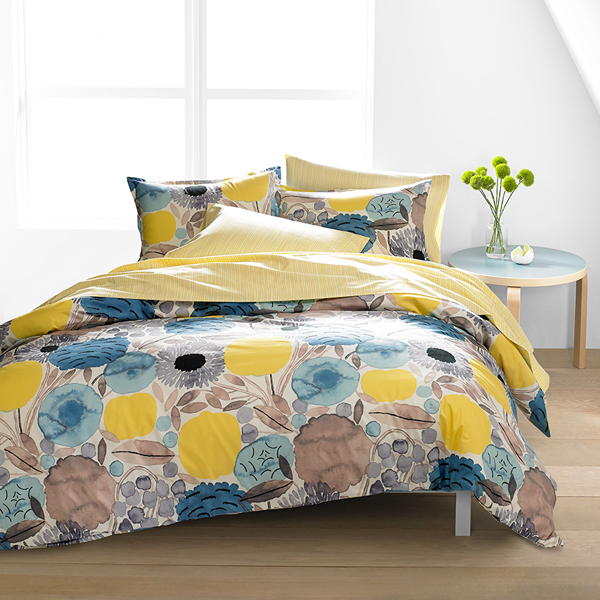 The Marimekko Sitruunapuu Duvet Set will brighten any room with its’ large scale botanical design in blue, yellow and brown toes. With this duvet set you will get a soft and comfortable sleeping surface with the soft percale cotton. I love the Eddie Bauer Mountian Plaid Scarlet Comforter & Duvet Set for a son or man’s room. The scarlet plaid print adds a whole new look to any bedroom. You will get a restful night of sleep with the 100% soft cotton materials. 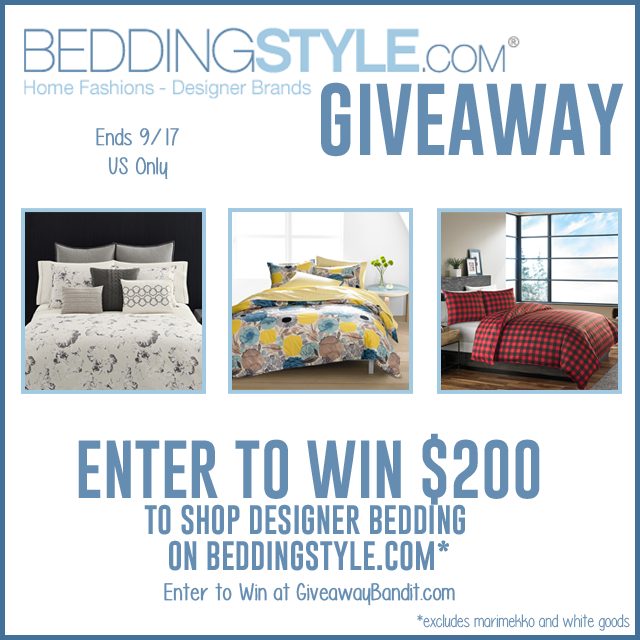 BeddingStyle.com is offering one lucky winner $200 to shop designer bedding in their online store (excludes Marimekko and White Goods). Giveaway is open to US only, ages 18 and older. Giveaway ends September 17, 2015 at 11:59 pm EST. Enter to win via the Rafflecopter entry form below. Prize to be fulfilled by the sponsor, BeddingStyle.com. Giveaway Bandit is not responsible for prize fulfillment. No purchase is necessary to enter. Void where prohibited by law. The odds of winning are based on the number of entries received Open to US, 18+ only. Confirmed Winner(s) (by Random.org) will be contacted by email. Winner(s) have 48 hours to respond before a new winner is chosen. No purchase necessary. Void where prohibited by law. The sponsor(s) will be responsible for product shipment to winner(s) of this giveaway. My blog is not responsible for product shipment/delivery. This event is in no way administered, sponsored, or endorsed by, or associated with, Facebook and/or Twitter, Google, Pinterest. This disclosure is done in accordance with the Federal Trade Commission 10 CFR, Part 255 Guides Concerning the Use of Endorsements and Testimonials in Advertising.